What is Eucharistic Adoration? It is when Jesus' body, in the form of a consecrated Host, is put on display for the faithful to come and spend time with Him. It is a time of unusual peace and quiet in today's busy world, where you can spend time praying, reflecting, meditating, reading, etc., whatever the Lord is calling you to do with Him. Holy Family Parish offers Eucharistic Adoration on most Fridays, at the church of daily Mass. It begins immediately following the 8:00 a.m. daily Mass (approx. 8:30) and concludes at 8:00 p.m. On the Friday before the first Saturday of the month, 24-Hour Eucharistic Adoration is offered. It begins at the regular time on Friday, but continues throughout the night, ending with the 8:00 a.m. First Saturday Mass. If a funeral is scheduled at the church during Adoration, Adoration may be postponed, closed during the service, or moved to the other church. Joining Flocknotes is a great way to keep informed of last minute changes within the parish. 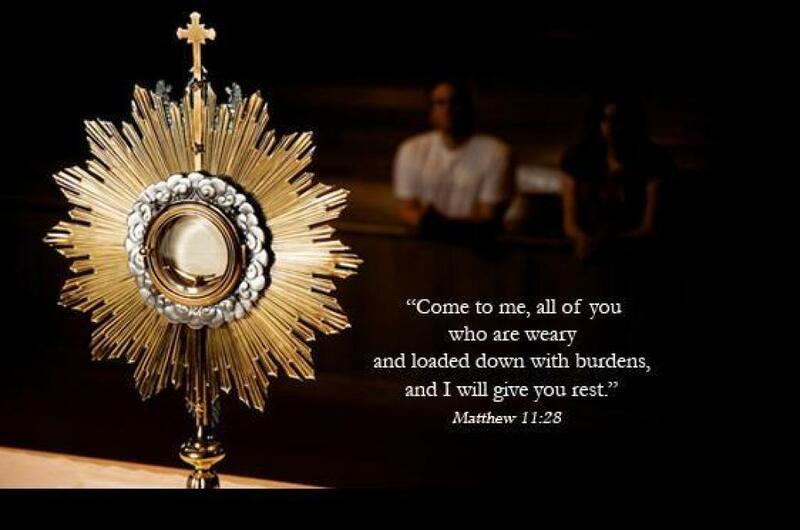 Everyone is invited to stop in and spend as much time as they'd like with Jesus in the Blessed Sacrament. To ensure that our Lord is not left alone, and for safety reasons, there are people who have signed up for specific one-hour time slots to be present with Jesus. If you would like to commit a specific hour of your time, each Friday or just during 24-Hour Adoration, please call the office, 372-2127.